Last night, I got some of my favourite pieces out of my wardrobe and arranged them around the room, draping different jackets on dresses and moving things around, trying different combinations. And you know what I wore today? Sweatpants. And a hoodie. And furry slipper boots. Some days, you just don't feel inspired, and if you think it doesn't hit style bloggers then you are wrong! In fact, I think it hits us worse than anyone else. Since started my blog, and especially since I've started to photograph my outfits regularly, I have striven to always try to come up with something new and interesting, to avoid re-wearing outfits and always try something different. But like anything, pushing too hard to try to be original usual concludes with outfit burnout. Despite having lots of wonderful new things for Christmas, I am drawing a blank. I looked outside at the horrible weather today and denounced the day as a sweatpants day, partially because I had absolutely no intention of leaving the house, and partially because I just couldn't come up with anything inspirational. I find one great way to really examine my wardrobe is to take a few things out at it so I can really see them. I spend a lot of time imagining outfits in my head, but I often don't really see what I have and what things look like. Sometimes in your head your forget little details that make a huge difference, or by taking some things out you are able to see things you forgot you had. Once your clothes are out and in front of you, move them around, play with them, take things off one hanger and put them with something else. Move jackets onto dresses or pick up tops to try with skirts. Add scarves or jewellery or shoes. Today I put a tartan scarf with a fur jacket- something I would never have tried, but I thought it might be cute and I loved the effect. So many of my outfits have been a result of putting a jacket on the same hanger as a dress I would never have thought of putting it with! Take what you love about a previous outfit and expand upon it. Change the shirt for a similar colour or style, change the jewellery, add some accessories, change the colour of your tights. This is a great way to experiment with remixing your wardrobe. How different can you make an outfit look with just a few changes? Back over the summer, I took Kendi's 30 for 30 challenge, which really encouraged me to stretch my wardrobe. 30 for 30 is a bit commitment and it takes time to think about your outfits, but as a challenge, pick a selection of items for an imaginary 30 for 30 (or 15 for 15, 10 for 10- whatever!) and see what you can come up with! You may only get five outfits, but it's new inspiration! This is something I try to do a lot, but it can be a challenge! Instead of seeing your wardrobe as lots of items of clothing, just pick one item and base your outfit around it. You could create one perfect outfit with the item, or see how many outfits you can come up with. Don't forget to write down or photograph any extra outfits (more on that in point eight!). Before Pinterest (follow me here) I kept (and still do keep) a folder of outfits that inspire me. I read a lot of blogs so it's a great way to make sure I can flick back over someone's outfit weeks or months in the future. Pinterest is a great way of doing this now- I find so much inspiration on there, and you can search by item if there's something in particular stumping you! Other blogs, Lookbook and Chictopia are other great places to go for inspiration! Now this might seem pretty nerdy, but I know I'm not the only one who does it! When I'm feeling especially inspired, I write down outfit combinations for future notice. I used to do this on random bits of paper, but now I have one outfit notebook so all my ideas are together. When I buy something new, I write down lots of ideas for the new item so on a busy morning I can just grab my notebook and I have something to wear! I've also started posted possible outfits on Instagram, which is another great way to capture potential future outfits. It also allows my followers to give their verdict too! This might sound pretty simple, but it's a great tip. Try something on, and build on that. It's amazing how different something can look once you already have it on. Add some layers, add some jewellery. Keep building until you have your outfit. For me, adding my glasses instead of contacts, or having my hair in a beehive, or curly, or adding a red or pink lip, makes a huge difference to what I want to wear. Sometimes I will do my makeup and hair first to give me something to build on. Sometimes I find my biggest problem is simply that I have too many clothes (don't say anything, Dad!) and too much inspiration, so I find changing my hair and makeup helps me to limit my choices. Everyone has their own classic style (saying that, mine has changed a lot lately and I'm a little thrown off! ), and a variation on this is the easiest way to feel inspired again. Put something on you feel good in, even if it is an outfit repeat. Go through your previous outfits and find something you love, and you're sure to feel more inspired! What do you do to help you feel more inspired? I'd love to know your tips! I really love this and will be bookmarking it for my humdrum fashion days. Love this!! Great advice on a subject that everyone experiences, but rarely talks about--being uninspired! You've got a great line-up of suggestions to combat it! I love the way you write...huzzah! I might have to steal that, it's too good. I love all these tips and I definitely relate, sometimes my comfiest sweat shirt is my "go-to item" lol. 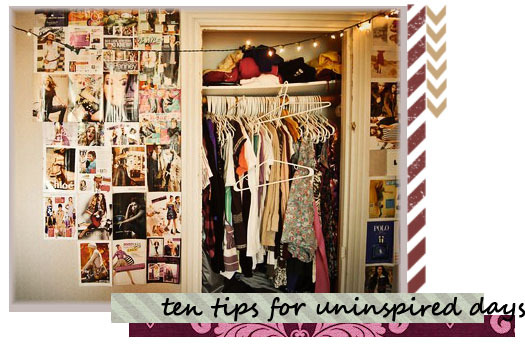 What a great post, some lovely tips and I'm feeling very inspired now to get rifling through my wardrobe. I have approximately ONE MILLION pieces of scrap with outfits scribbled on them. ALL OVER DA PLACE! I mean, its so dorky when I reach into my purse and about 20 fall out and whoever helps me pick them up looks at me like I'm insane. Whenever I'm tempted to wear sweatpants, I opt for all black and a chambray top because oy vey the outfit planning funks we bloggers can fall into are just SO draining...I need to have that backup uniform! I LOVE THIS POST by the way. In fact, I'm tweeting it. Amazing post! This has really inspired me. Can't wait to play with new combinations at the weekend! Brilliant post! I really like 6 (I keep a notebook with magazine cutouts pasted in it, it's very full!) and number 2 because it's something I recently discovered myself. Fabulous ideas. Bookmarked so I come back to it on uninspired days :) Thanks for the tips! ooh I love all these tips! I have an inspiration board right next to my closet, so I use editorials to help me when I feel like I have NOTHING to wear! you are such a cutie. happy to be a new follower! Oh goodness, this is my lifesaver! I am currently in this situation, I feel like all my pieces are beginning to look the same. Thank you so much for posting this, it helped me so much. And wearing sweats isn't a bad thng every once in a while:) I love your pictures by your closet by the way! thanks for this little boost, girl. i think so many times i feel like i need to go shopping for new clothes. but really, it's all about the mixing and matching, and coming up with new ways to wear things. perfection! As a fellow blogger, I totally get this! Sometimes you need a fashion kick-start so thank you! Check out my blog whenever you get a chance! Any feedback will be appreciated! Such great inspiration here. I need to work on putting different pieces together... started that more in 2011 and it's definitely a goal in 2012. Great to be on the links a la mode list with you this week. GREAT list! Thank you for posting it! comfiest sweat shirt is my "go-to item" lol. information in this blog is extremely useful for the people. very informative content is here, thanks for sharing such info.